The family Urodacidae was abolished by Soleglad, Fet & Kovarik in April 2005, and Heteroscorpion was transfered to the new family Hemiscorpiidae and Urodacus was transfered to Scorpioniddae. This family consists only of 2 genera with 24 species [Updated 26.08.04]. The genus Urodacus was originally placed in the Scorpionidae (subfamily Urodacinae), but was recently elevated to family status by Lorenzo Prendini (This is not reported in Fet et al. (2000), but the family status is recognized by Dr. Fet (pers. comm.)). 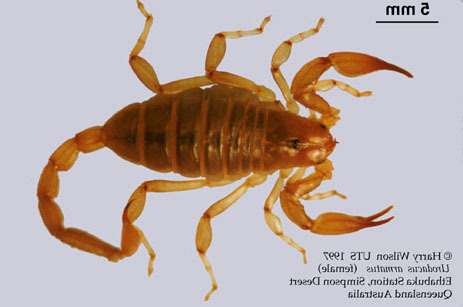 The elevation to family status was based on a cladistic study of the superfamily Scorpionoidea. See Prendini's publication for details (see below). 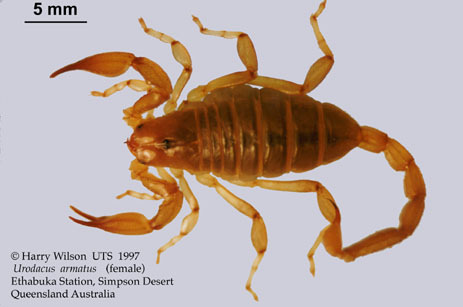 In a major revision of higher scorpion systematics by Soleglad & Fet (2003), the genus Heteroscorpion was also included in Urodacidae. This genus was previously placed in Heteroscorpionidae, which is abolished (and before that, Ischnuridae), and is endemic for Madagascar. Urodacus is endemic for Australia. Some scorpions in this family are kept in captivity in Australia (not Heteroscorpion). No medical data have been found, but the members of this family are probably of minor or no medical significance. Urodacus armatus photos by Dr. Harry Wilson. Prendini, L. (2000). Phylogeny and classification of the superfamily Scorpionoidea Latreille 1802 (Chelicerata, Scorpiones): An exemplar approach. Cladistics, 16, pp. 1-78.